Yet another great sandwich that was created in New Orleans in the early 1900's. This sandwich is right up there with the Po' Boy as one of my all time favorites. Of course, this version is so much healthier for you, but doesn't compromise any flavor or texture. It contains smokey grilled eggplant, zucchini, portobello mushrooms, roasted bell peppers, spinach and of course the famous olive/cauliflower salad which gives it its distinct Sicilian flavor! If you don't have time to make the olive salad from scratch, you can purchase a jar of Giardiniera, which is pickled vegetables (cauliflower, carrots and celery), along with some black and green pitted olives. Drain the giardiniera and add everything to a food processor and pulse until chopped. Or you can use my recipe below...incredibly fresh and delicious! Preheat broiler to 475 degrees and char bell pepper. Let cool, remove skin, seeds and finely chop. Steam cauliflower and carrots until tender, let cool and chop. Pit and chop olives and chop celery. Combine all ingredients together and let marinate for about 24 hours. Check for seasonings and add more salt, pepper, red wine vinegar or olive oil, if needed. I grilled my vegetables, but you can roast them in the oven or saute. Grilling or roasting uses a lot less olive oil, especially for the eggplant, which seems to soak up a lot of oil otherwise. Regardless, use whatever method is easier for you. I also grilled my bread before adding all the other ingredients. It was crunchy on the outside and soft in the middle. 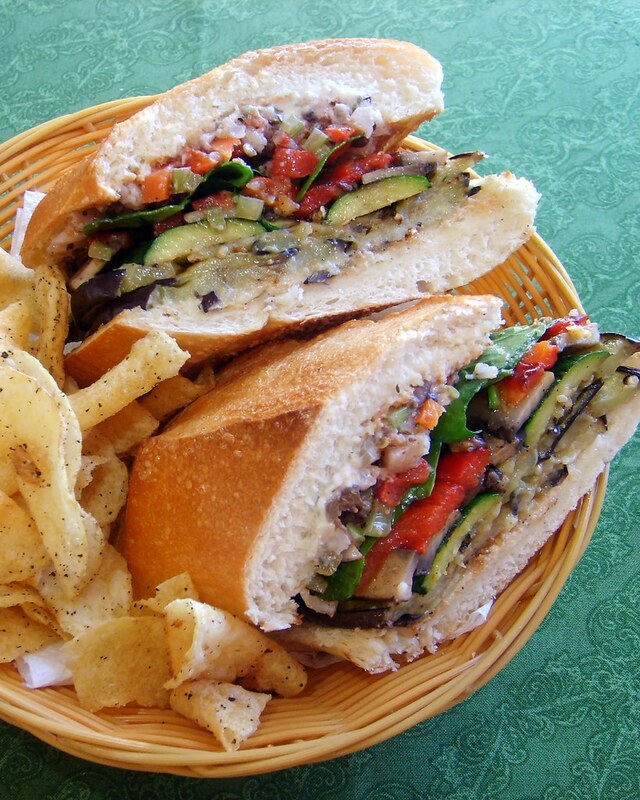 On the bottom half of the grilled bread, layer eggplant, zucchini, mushrooms, red bell pepper, and spinach. On the top half, add a large serving of the olive salad and drizzle with a little bit of olive oil. Enjoy!